Track Day is unique event for motorcycle riders where amateurs and professionals meet. This time we are moving to Auto24 Ring where the new track is waiting for us. This will be the fist big moto event at auto24ring on 25th of August!!! The main purpose of this event is to create opportunity for all riders to improve their riding skills. Therefore, main part of the event will be dedicated for training. Depending on the riding skills, all riders will be divided into 4 groups. Each of them will have six 20 minute training sessions. There will be Baltic Rookie Cup race in the end of the day where all riders except Superbike, Supersport and Superstock licence holders can take part. - Prizes for the final races winners! The price for those who register and pay not less than 7 days before the event is 70 EUR, not less then 3 days before the event 80 EUR and later 100 EUR. Track Day - unikalus renginys, kurio metu greičiu gali mėgautis tiek mėgėjai, tiek profesionalai. 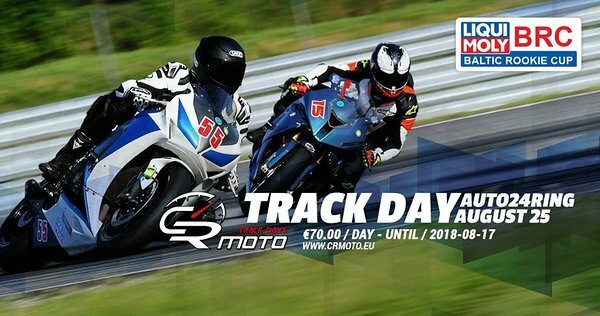 Track Day - treniruotės motociklininkams, kurių metu dalyviai bus suskirstyti į grupes, priklausomai nuo rato įveikimo laiko, todėl greitesni vairuotojai netrukdys lėtesniesiems ir atvirkščiai. Jums bus pasiūlyta - laiko matavimas (įskaičiuotas į kainą), saugumą trasoje prižiūrės profesionalūs teisėjai ir greitoji pagalba. Renginio metu galima bus įsigyti ir pasikeisti padangas. Be abejo, bus puiki nuotaika ir bendraminičių ratas. Asmenims užsiregistravusiems ir sumokėjusiems likus ne mažiau nei 7 dienos - 70 EUR, ne mažiau nei 3 dienos - 80 EUR, o mažiau nei 3 dienos - 100 EUR.